Just happened to see this list of street closures for the Super Bowl, and it looks like there is going to be a ton of traffic whipping by the Clearydome as the main drag (Broad Ripple Ave) is shut down. It seems to say from Wednesday to Sunday. Kinda BS I think. Broad Ripple Ave will be closed from the west side of Winthrop Ave. to the east side of College Ave.
Carrollton Ave will be closed from Broad Ripple Ave. south to Hubbard & Cravens Coffee & Tea Co.
Guilford Ave will be closed from Broad Ripple Ave north to the alley adjacent to Bleecker Street and south to the alley servicing BW-3. E. Westfield Blvd. will be open through the village with traffic eastbound only from College Ave. to Guilford Ave. and east/west traffic from Guilford Ave to Winthrop Ave.
Guilford Ave. closures at the alleys will allow the alleys to stay open to service traffic, deliveries, and parking. Although closed, Broad Ripple Ave will be accessible from Winthrop Ave. to Carrollton Ave during yet-to-be determined hours for deliveries and at all times for emergencies. 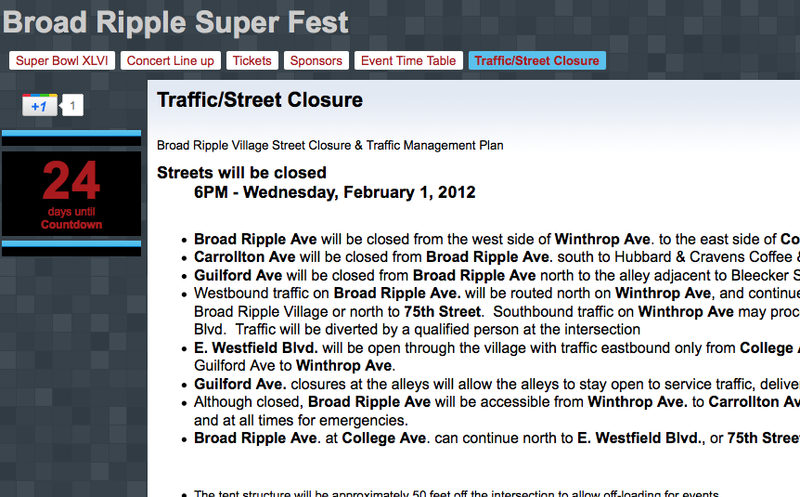 Broad Ripple Ave. at College Ave. can continue north to E. Westfield Blvd., or 75th Street, or south to Kessler Blvd.